The World Cup may be a highly anticipated event for football fanatics, but it also provides a conundrum to the business world. Purveyors of TVs, tourism and takeaway meals are banking on a World Cup bonanza while bosses strive to avert a four-yearly wave of worker absenteeism. As football’s flagship tournament kicks off in Russia, businesses around the world are looking to either cash in or find creative ways to stop productivity plummeting. Fan passion runs high well beyond the game’s traditional power centers of Europe and Latin America, underlining the potential benefits as well as pitfalls for companies. With a record four Arab countries having qualified, including Liverpool striker Mohamed Salah’s Egypt, one survey released this week said 92 percent of employees in the region plan to watch at least some of the tournament — including a quarter who intend to secretly follow it by live stream while at work. 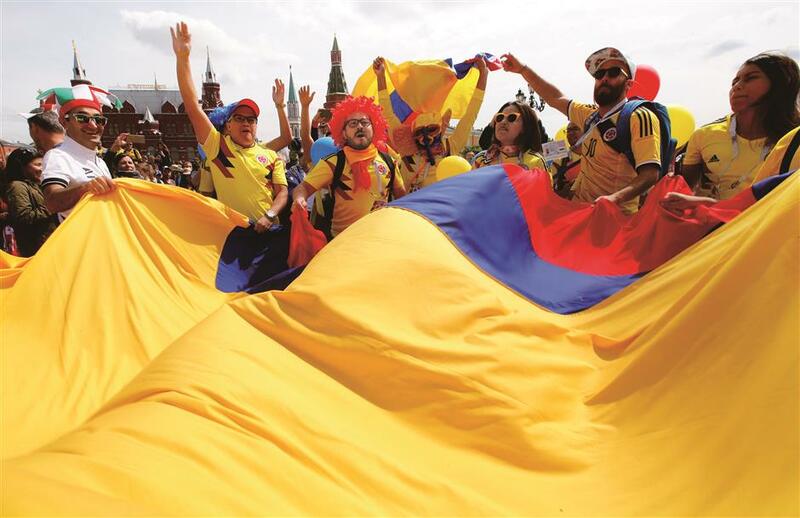 Supporters of the Colombian national soccer team hold a giant flag on the first day of the 2018 FIFA World Cup in central Moscow, Russia. “Other strategies employees reported they would use to watch the games during working hours include requesting a full day of annual leave, leaving work early to watch the games, or simply calling in sick,” said GulfTalent, an online recruitment portal, whose survey covered 8,000 respondents across the Middle East. Bosses are being urged by employment consultants to avoid an own goal by fostering team spirit with World Cup viewing parties or inviting clients in for tournament-themed events. In Germany, whose team are among the perennial tournament favorites, steelmaker ThyssenKrupp will organize a viewing event at its Essen site and others are planned at different plants, but “production can’t stand still,” a spokesman said. Lufthansa will run a rolling World Cup party — with non-alcoholic drinks — in its Frankfurt operations center where flight crews rest between trips. Despite German employers’ efforts to accommodate shift patterns, the tournament will still cost Europe’s biggest economy more than 2.6 billion euros (US$3.1 billion) in lost production, according to a study by the University of Hohenheim in Stuttgart. Saudi fans watch the World Cup match between Russia and Saudi in a private resort in Riyadh, Saudi Arabia. In contrast to Germany, England are perennial World Cup underachievers but even in Britain four years ago, productivity was dented by as much as 4 billion pounds (US$5.3 billion), employment consultancy ELAS said. 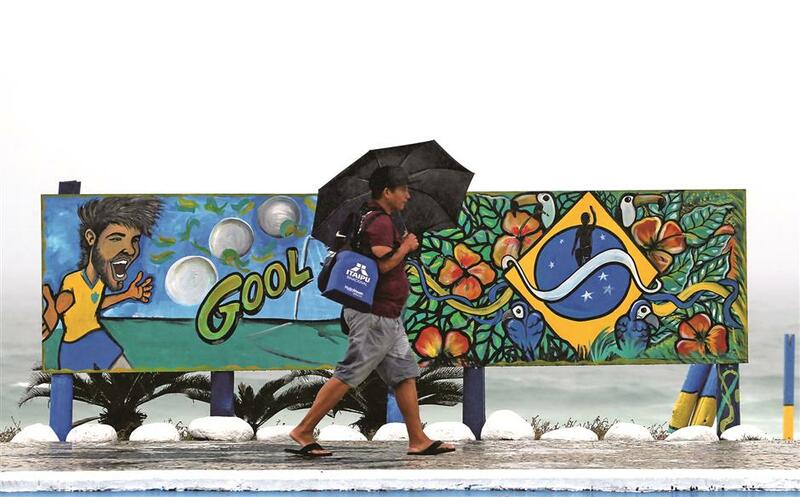 A man walks next to graffiti depicting Brazilian player Neymar at Barra da Tijuca in Rio de Janeiro. Bars along with pizza and burger chains around the world are running promotions for stay-at-home fans, while large numbers of those traveling to Russia hail from some surprising quarters. Flight bookings to Russia from the US and China are up significantly despite neither country qualifying for the tournament, according to ForwardKeys, which analyses patterns in global passenger reservations. Overall, Russian tournament organizers expect at least 600,000 international visitors to the World Cup, while the state tourism agency forecasts 1 million. That is despite expensive hotels and the higher cost of indirect flights to the far-flung venues.